Slide the rear chassis subassembly into the server. Note - If the rear chassis subassembly does not click into place, remove the subassembly and ensure that the flexible LED assembly is seated correctly. Ensure that the rear chassis subassembly is correctly and evenly seated inside the server chassis. 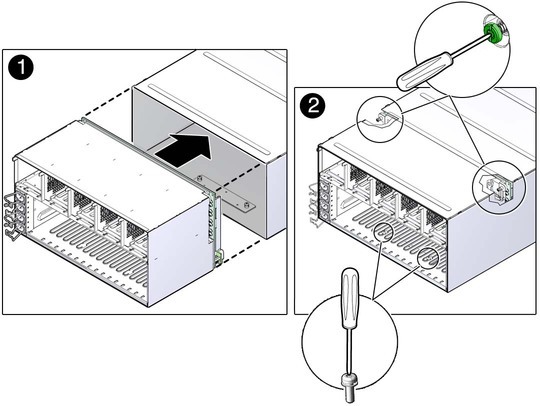 Check the lower edge of the subassembly to ensure that the subassembly is seated all the way inside the server chassis. Using a Phillips screwdriver, tighten the four green screws to secure the rear chassis subassembly in the server. All five fans—see Install a Fan Module. All express modules or filler panels—see Install an Express Module. Verify that you are installing the express modules back in their original slots using the notes that you took when removing the cards from the slots earlier. Rear I/O module—see Install the Rear I/O Module.